Back home in Puerto Rico these are called “gallinas de palo” (“tree-chickens”?). Iguanas like these were introduced to the wild in Puerto Rico during the 1970’s… they were popular as pets until people realized how quickly they tended to outgrow their welcome (quite literally). And so they ended up in the wild, as many unwanted pets do. And so, just like any invasive species, they began to multiply and now they are everywhere… they routinely interfere with operations at the international airport runway and their splattered carcasses adorn most roads in Puerto Rico. 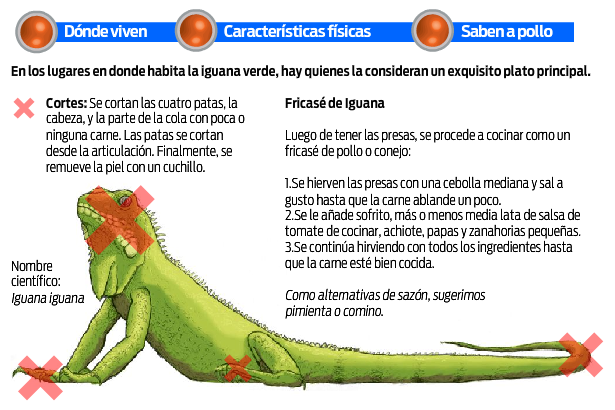 Today’s edition of one of the local Puerto Rican newspapers (El Nuevo Dia) proposes eating iguana as one of the most feasible and convenient ways to deal with the island’s iguana crisis. I’m not sure if this is an April Fool’s joke or just odd, although this wouldn’t be the first time I’ve heard about eating these little guys. Click on the picture above or the link below for infographic fun on how to prepare and cook one of these lizards. They ran a follow-up story today. Those empanadas have iguana meat inside! This entry was posted on April 1, 2008 at 7:50 pm and is filed under On My Radar, Puerto Rico. You can follow any responses to this entry through the RSS 2.0 feed. You can leave a response, or trackback from your own site.